Thanks, will release some workaround today. Meanwhile try to switch to Interface tab and save preferences. Next time Blender should be opened in that tab. I’d appreciate some help, I’ve set up a pop up menu to change the value in the field 1 when I’m using the transform gizmo tool. Instead it changes the global value 2. The workaround is to leave the tool value at default and change the global value. But how do I set a tool specific value? Oh sorry, it works fine. There was a hotkey conflict. I had the hotkey bound to ‘alt 1’ and for some reason while in object mode the macro wouldn’t execute because of the default ‘hide objects by collection’ hotkey bound to ‘1’. I’ve download your update, installed it and restarted Blender. A properties popup I created will still only pop up on the left half of my screen? It does the same if I change it to Dialogue Mode, but if I change it to Pie Mode it will pop up anywhere in the 3D view under my cursor? Hi, please export and send me the popup. Hmm, looks like it’s a Blender issue. Thanks! That works perfectly I noticed that you were put down as the author of the SmartFill script/addon. Is there any plans for that addon being updated for 2.8? I really loved the functionality and it’s sorely missed in 2.8. Thanks for all the hard work! I noticed that you were put down as the author of the SmartFill script/addon. Is there any plans for that addon being updated for 2.8? Nope, I’m just a co-developer. But I’m going to help with porting Smart-add-ons because I’m using some of them myself. Will contact the author when I finish porting my add-ons. Here’s an exported JSON of the single ‘RR_tools’ menu. Hi, I noticed that in the latest 1.15.14 the small arrows next to the description of the pie are gone. Works for me - I’m using pme 1.15.14 and the 1/22 build. I’m using blender-2.80.0-git.dd3f5186260e, downloaded few hours ago. Try to reproduce in the next build and send me the output from command line. Hi roaoao… can you add CLICK option to “select open mode” (Press, Click, Hold, Double Click, Tweak) ?? or point me some workaround. 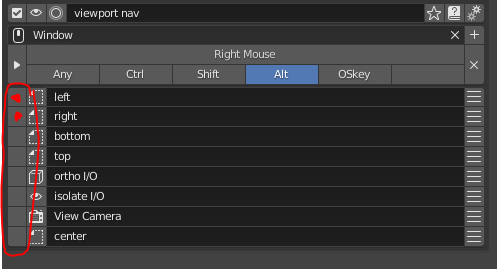 Blender input settings has Press and Click options and I can map diferent actions. how to use the toggle button in pie menu? ex… if already in vertex mesh mode, pie menu vertex mode button show enabled (pressed), if I click another mode (edge or face) vertex button change to unpressed and new clicked button change to pressed state. Has some way to set tooltip text to pie button?